Much loved and frequented by visitors to the Scottish Highlands, Oban is visited for its own charms and as a base to explore the hinterland and islands like Mull and Iona, easily reached by ferry. 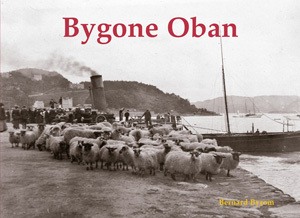 It being many years since we published Michael Hopkin’s Old Oban and Chris Uncles’ larger book on the area, we felt it was time to produce a new book on the town with a completely different set of old photographs collated and written up by a different author. The low-hanging fruit of more often seen old photos long-gone for t he other books, the selection here is more quirky and unusual and surely thus more interesting. The inside cover shows a stunning panorama of the town pre-1880. Other subjects include the Queen’s Hotel on fire, Carnival Day with a parade of bullnose motor cars, photographer Scrivens’ studio, churches, an art deco style Marine Hotel, fishing industry, the Northern Lighthouse Board’s helicopter, Burrows ship-yard on fire, the 1970s glass factory and more.